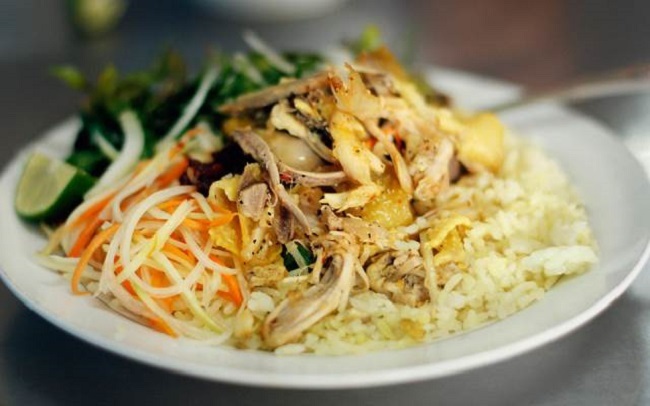 Cao lau is a unique and distinctive dish associated with Hoi An ancient quarter. Actually, cao lau is a kind of special noodles with complicated process. Rice will be soaked in ash water made from wood at Cham island overnight to make a soft but dried and crunchy pasta for the dish. Then rice is ground to make flour with water from Ba Le well then cut into small pasta, steamed and dried several times to keep noodles with the best quality even being left overnight. Cao lau is often served with xa xiu (Chinese barbecued pork slices), beansprouts, fresh herbs, fried pork rinds, peanuts and added sauce or spring onions, lime, pepper and chilli jam. 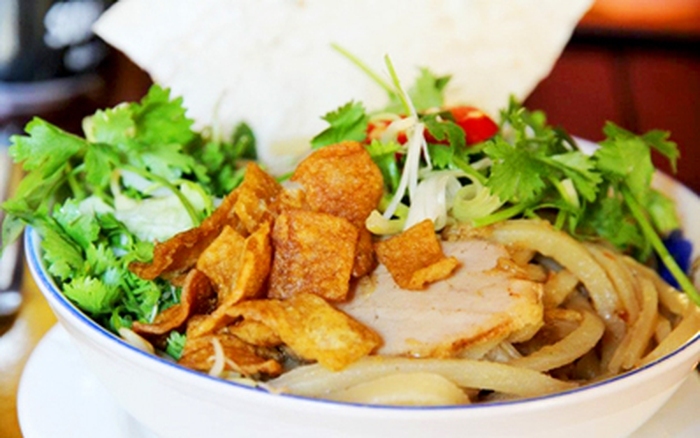 Com ga Hoi An is one of must try food suggested for every visitor when landing on this place. This dish has an eye catching yellow colour of rice because rice is soaked in turmeric and cooked with chicken broth and pineapple leaves by wood that absolutely create an amazing fragrance for the food. After being boiled, chicken will be shredded into small slices, marinated with various spices and squeezed with onions, salt, pepper and laska leaves or mints and lime. At the end stage, com ga will be served on plates, flavoured with sour papaya, coriander, soy and chilli sauce. Even you only taste com ga once time, you are possibly unforgettable the distinctive aroma of the dish. Banh xeo is a typical snack or appetiser in Hoi An. The crispy crepe is made from fried rice flour mixed with coconut milk and turmeric and filled with pork belly, shrimp, beansprout, peanuts and mushroom. The layer of banh xeo is made very delicately in order to keep the crepe slightly and crispy but not broken, golden but not burned yellow. To enjoy banh xeo, you have to wrap it into rice paper and fresh lettuce leaves then dip in sweet and aromatic fish sauce. It seems that all flavor is melting in your mouth and you should try when it is still hot. Hoi An locals like eating banh xeo in cold season or rainy days that is different from people in the north and the south where they can eat at any time. Undoubtedly, Banh xeo is definitely a dish you must try to enjoy Hoi An local cuisine. Banh mi is a kind of Vietnamese baguette, a favourite street food for every travellers. Within 20000 VND, you can buy for yourself a load of bread that is filled with pork or beef slices, fried eggs, pickled vegetables, coriander, cucumber or sour papaya salads, liver pate, ham, butter, chilli and hot pepper. Home-made sauce and pate are the most important secrets to make Phuong bread become more popular and attract visitors by special taste nowhere else have. Biting a small piece of warm bread, crunchiness of crust melt in mouth with all spices, meat fillings and vegetables brings you an amazing experience in Hoi An. Banh beo is very popular in central of Vietnam and become a speciality of Hoi An cuisine. Banh beo includes two parts: rice flour layers and stuffings (shrimps, minced pork meat) and often added with roasted peanuts, spring onions, green chilli. When tasting the dish, food stall sellers or street vendors will team rice powder a few minutes then serve on a small bowl with stuffing cake, grease and dried onions on the top. It depends on each person's taste to add more fish sauce to flavor the dish. Banh beo is served with white, soft cake layers and aromatic fillings that is appealing to eaters and visitors.